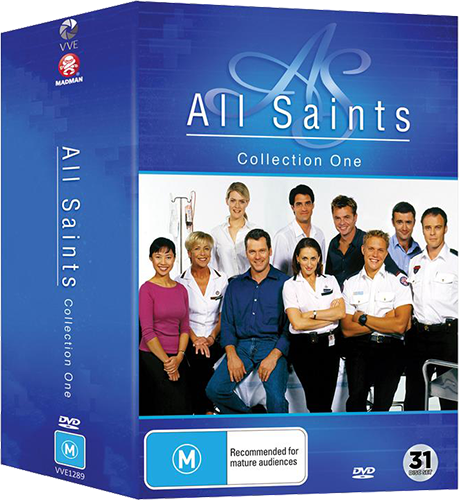 Win All Saints Collection 1: Revisit the emotionally-charged ER drama | SWITCH. Due to an overwhelming demand from fans, 'All Saints' is heading to DVD for the first time. The much-loved medical drama launched the careers of Aussie acting giants Georgie Parker, John Howard and Yael Stone, with a series that spanned 12 seasons. Emotionally-charged storylines, dynamic characters and a superb cast culminates in addictive viewing. Regularly attracting over two million viewers per episode, fans of the show were hooked by the compelling characters and dynamic plot lines that unfolded over 493 episodes that aired between 1998 and 2009. Collection One features Seasons 1-3 in a 31-disc box set. The 'All Saints Collection 1' competition has now closed. Winners will be announced shortly. Competition opens at 5pm AEST on Sunday 16th September 2018 and closes at 11:59pm AEST on Sunday 23rd September 2018. Three winners will be chosen at random on Monday 24th September 2018. To successfully win, entrants must fulfil the above entry conditions before the time the competition closes. Current members/followers are eligible to enter the competition. Only one entry per person. Only one winner per household. To be a valid winner, the entrant must not have won a prize from SWITCH within the last 28 days. Each winner will receive one box set copy of 'All Saints Collection 1'. By entering, you agree to receive occasional emails from SWITCH in the future. If you decide to unsubscribe from these updates, any further entries will not be applicable. Only Australian residents are eligible to enter. 'All Saints Collection 1' is available on DVD on Wednesday the 19th September 2018 from Via Vision Entertainment.